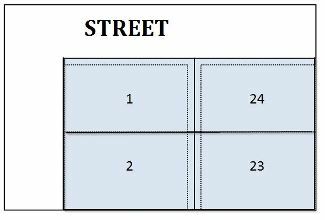 Both street right-of-ways and platted utility easements on a lot may legally be used for city owned and private utility company facilities. It is important for property owners to recognize where these areas are located on their lot in order to safely and properly improve their property. The map to the right is a section of a typical East Grand Forks development plat map. City code requires property developers to plat or subdivide land following a specific set of rules before development can occur and buildings can be built. The general purpose of this process is to provide sufficient room for construction on the lot in compliance with the codes and to provide room for streets, alleys, and installation of utilities to serve the area in an orderly, efficient and coordinated manner. In East Grand Forks, the typical street right-of-way on a development plat is 80 feet wide. The typical finished street width from the back of one curb to the back of the other curb is 41 feet. This means that for a typical lot, the front property line is about 19.5 feet behind the back of the curb. The typical utility easements in areas with-out alleys is 20 feet wide and is split equally between lots which adjoin at the rear. Each lot has a 10 foot easement across the width of its rear yard. Examples of this are the rear easements across lots 1 and 24 and lots 2 and 23 in the sample plat map shown at right. Side yard easements such as those shown for lots 1 and 24 may vary in width depending on the purpose for the easement. In areas of town with alleys, the typical width of the alley right-of-way is 20 feet. A portion is used for the driving surface and the rest may be shared with utilities. Some old parts of town have 10 foot alleys. Please check the plat map for your area since there are some local variations. The city Administrator’s office has the official plat maps. The Water and Light Business office in City Hall also has copies. The City of East Grand Forks has the right to keep all utility easements free from hazards, structures and other improvements which might hinder the city’s ability to serve and maintain such utilities. The National Electric Safety Code requires adequate working space and clearances for all utility equipment that must be examined or adjusted. A clear working space sufficient for performing the necessary work must be maintained. 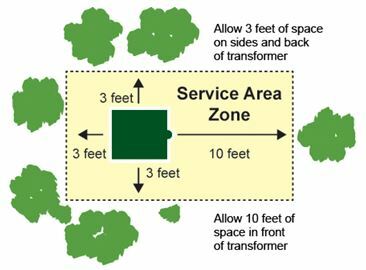 When considering any improvement around our green utility boxes marked with a WARNING Hazardous voltage inside sticker, please keep shrubs and structures 10 feet away from the side with doors and 3 feet from the other sides. (see picture at right). Please know that any obstructions that are in the easement or too close to the green utility boxes may be removed during service restoration and maintenance if need be. So, keeping obstructions a proper distance from utilities will make life much simpler, easier and safer for all of us. Thank you. If you are planning any digging on your property, state law requires you call Gopher State One Call at least two (2) business days in advance. This free service ensures underground utility lines are marked with color-coded paint or flags (see color-codes to the right). Keep in mind, hand digging is required within two (2) feet either side of the utility markings. Call 1-800-252-1166 or 811. Gopher State One Call initiates all utilities to locate their lines, electric, water, sewer, cable, gas, phone, etc. They have 2 business days from the time you make the call to locate the utilities and digging is not to begin until that time is up, so plan ahead. A penalty may be assessed if Gopher State One Call is not called and utility lines are hit when digging.